There are plenty of Windows Vista with SP1 (Service Pack 1) integrated version of DVD image files available from download from Internet (64-bit Windows Vista SP1 download), especially via BT (BitTorrent) network using torrents or eDonkey2000 (eD2K) P2P sharing network. However, lesser known is that, generally speaking, there are indeed two versions of Windows Vista with SP1 integrated DVD ISO image. One is the true, original and official Microsoft made integrated Windows Vista SP1 setup DVD image, normally released via OEM, MSDN, TechNet, and when user purchase from retail shelf. Another version is user custom-made self-slipstreamed Windows Vista SP1, which based on Windows Vista RTM edition, and then installed and upgraded with the new service pack 1 standalone package using various methods of SP1 slipstream process. Almost all versions released on the web for download are labeled freely by the uploaders, making the accurate identification hard. So how to differentiate and determine if a Windows Vista installation is done by DVD media image of Windows Vista SP1 that is a genuine official Microsoft versions or ‘fake’ user made slipstreamed versions? Users can check and recognize a Windows Vista DVD media is indeed a Microsoft official true copy from EULA (End User License Agreement) or Microsoft Software License Terms. EULA can be viewed during initial stage of Windows Vista setup installation process, allowing user to quickly recognize how the Windows Vista SP1 is been made (Microsoft integrates or user slipstreams). 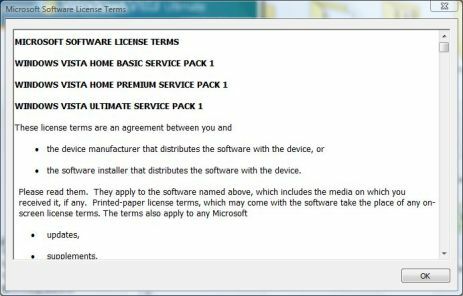 After installation, EULA can be displayed by viewing the License Terms. To view Microsoft Software License Terms, open Windows Explorer or Task Manager (taskmgr), and then click on Help menu item (in Windows Explorer, press Alt key first to reveal the menu bar), and then click on About Windows or About Task Manager. Inside the dialog box appears, there is a link to open the EULA in the sentence of This product is licensed under Microsoft Software License Terms to:. 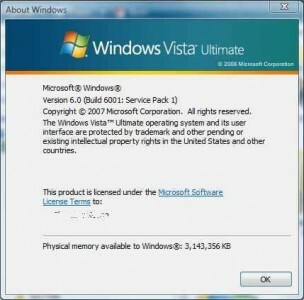 Click on Microsoft Software License Terms link to reveal another window showing the terms of Windows Vista. Windows Vista SP1 installed with Microsoft released Windows Vista with SP1 integrated DVD media will have the title showing WINDOWS VISTA HOME BASIC SERVICE PACK 1, WINDOWS VISTA HOME PREMIUM SERVICE PACK 1, WINDOWS VISTA ULTIMATE SERVICE PACK 1 or similar wordings for other editions on top of the terms. At the end of the document, there is another identification text of EULAID:VistaSP1_R1.0_CONSUMER_OEM_en-US, EULAID:VistaSP1_R1.0_CONSUMER_RTL_en-US or similar code, depending on OEM, RTL (Retail), and language editions. For Windows Vista SP1 which is upgraded from Windows Vista RTM and slipstreamed with SP1, normally the EULA document is not changed. So the documents will still mention only WINDOWS VISTA HOME BASIC, WINDOWS VISTA HOME PREMIUM, WINDOWS VISTA ULTIMATE or similar wordings for other editions on top of the terms. And the EULA ID will has the following format: EULAID:VistaSP1_RM.1_CONSUMER_OEM_en-US, EULAID:VistaSP1_RM.1_CONSUMER_RTL_en-US or similar code, depending on OEM, RTL (Retail), and language editions. 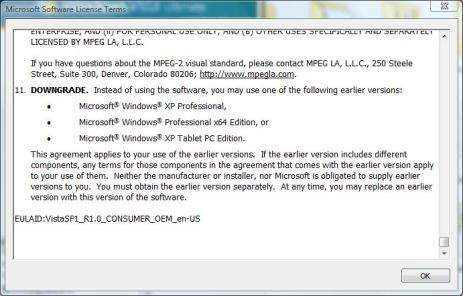 Note that this recognition method is not foolproof, as the upgraded version of Windows Vista SP1 from RTM version can still has the updated EULA is the slipstreamer decides to change the EULA to SP1 version. Beside, take heart that no matter whether you’re using Microsoft released Windows Vista with SP1 integrated DVD, or any user-made Windows Vista with SP1 slipstreamed DVD, they’re all a valid Windows Vista SP1 media, and do not offer any differences in computing experience.